The World famous Exuma Pigs of Staniel Cay swim out to greet you as your boat glides through the crystal clear water. Stepping out onto an untouched beach, you lose yourself in the elegant paradise of Staniel Cay. The ocean shimmers like millions of turquoise gems with every shade of blue stretching out to the horizon. With hidden grotto's, exotic wildlife and a fascinating underwater plane wreck that make Staniel Cay my favourite place to visit in the Bahamas. The World famous Exuma Pigs of Staniel Cay swim out to greet you as your boat glides through the crystal clear water. Stepping out onto an untouched beach, you lose yourself in the elegant paradise of Staniel Cay. The ocean shimmers like millions of turquoise gems with every shade of blue stretching out to the horizon. With hidden grotto’s, exotic wildlife and a fascinating underwater plane wreck that make Staniel Cay my favourite place to visit in the Bahamas. 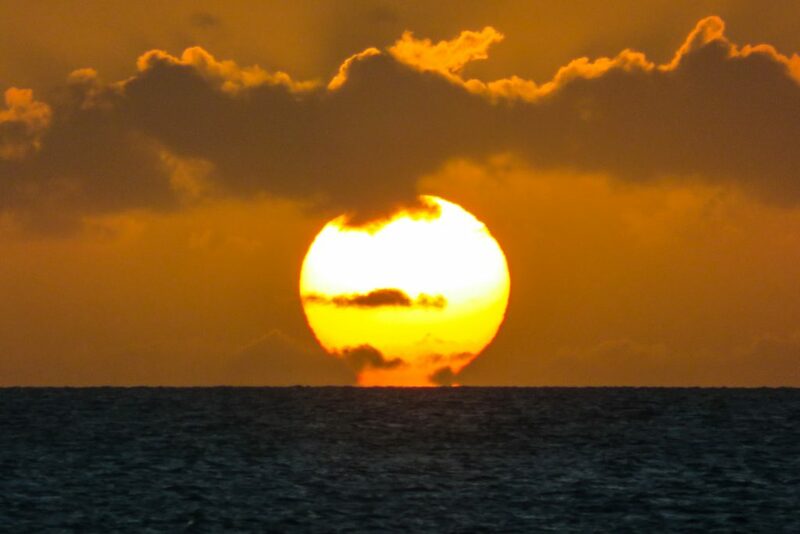 The string of 365 northbound islands, known as the Exuma Cays, is part of the Bahama’s Out Islands. 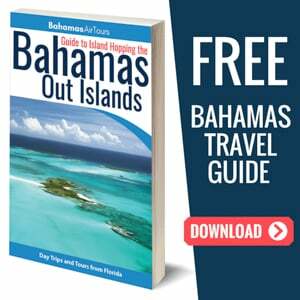 While few people know about the existence of the Out Islands, and fewer still have even visited, this series of islands takes up 84% of the Bahamian landmass. What this means is that the majority of the Bahamas is relatively unexplored. The Out Islands allow you to experience the Bahamas in a way that nowhere else does. They provide the authentic Bahamas experience, with mesmerising, untouched islands and no tourism en-mass to crowd your tropical getaway. We are LIVE in the Bahamas and Staniel Cay this Weekend, follow us on Facebook and Instagram. If the exceptional scenery isn’t enough to catch your eye, then the Exuma Pigs certainly will be. 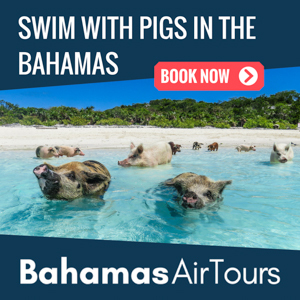 Also known as the Swimming Pigs of the Bahamas, their adorable allure as they swim through the crystal-clear shallows is undeniable. While the Pigs may offer the cute factor, no vacation is complete without a little adventure and excitement. A visit to the Thunderball Grotto, named after the 1965 James Bond spy film that featured this stunning cave, will undoubtedly add excitement to your visit as you snorkel your way through its underwater entrance. With exotic wildlife like the Bahamas Rock Iguana and the Exuma Pigs, outstanding scenery, excellent attractions and some of the world’s most luxurious accommodation like the Staniel Cay Yacht Club, it’s small wonder that this is one of the world’s top destinations. It is so great, in fact, that a number of celebrities, including Johnny Depp, own private islands along the Exuma Cays just to get a piece of this mesmerising paradise. 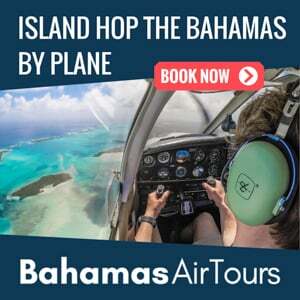 While for the time being, the only way to reach these marvellous islands is by private plane or private boat, you can now fly from Florida to Bahamas direct to Staniel Cay with Bahamas Air Tours and explore this fantastic destination with ease. Or visit Staniel Cay in a day on their unique Bahamas One Day Tour. The James Bond films are always full of spectacular scenery, exotic wildlife, luxury hotels, yachts, speedboats and planes that make for an incredibly exciting and compelling story. The island of Staniel Cay makes you feel as if you’re in your own James Bond film, providing all of this and more. To really top off this ‘James Bond’ experience, you will even have the chance to explore the underwater wreck of a 1980’s drug smuggler’s plane! The site is such a perfect set for a James Bond film, that two of them were actually filmed here, Thunderball, and Never Say Never Again. The island has, in fact, embraced the James Bond theme so entirely that they even have an annual James Bond Casino Royale night! The reason these islands don’t have an overload of tourism is that there are very few ways in which you can explore them. Your best bet is to arrive in Nassau and rent yourself a boat to go to the Out Islands and explore them yourself. 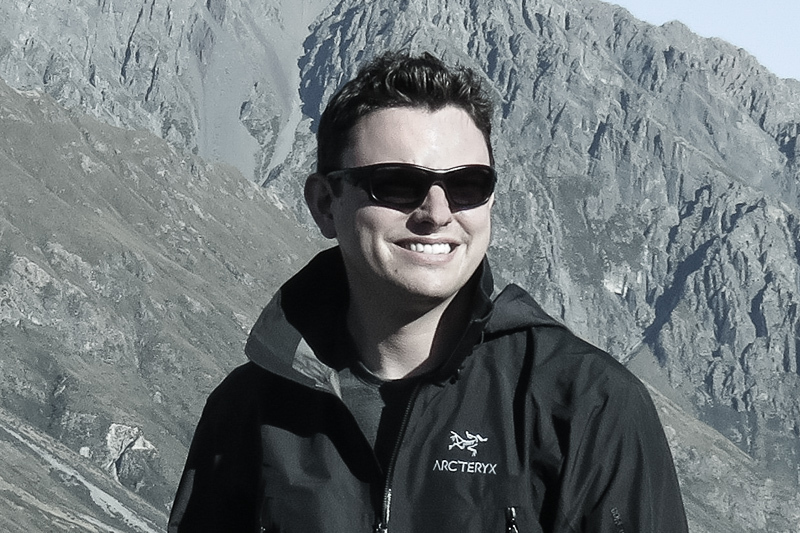 The far more scenic option is to hire a plane and pilot it over this glorious landscape. Soaring above the turquoise ocean and flawless beaches gives you incredible views of vast water adorned with these spectacular islands. You will be able to land at the Staniel Cay airport after a long day of exploration and make your way to your excellent accommodation at the Staniel Cay Yacht Club. If you’d prefer to feel the wind in your hair as you skim along the water’s surface, then your best bet would be to hire a speedboat from the Staniel Cay Yacht Club boat rental for a half-day or a full-day. This gives you endless freedom to explore the surrounding islands as you see fit. 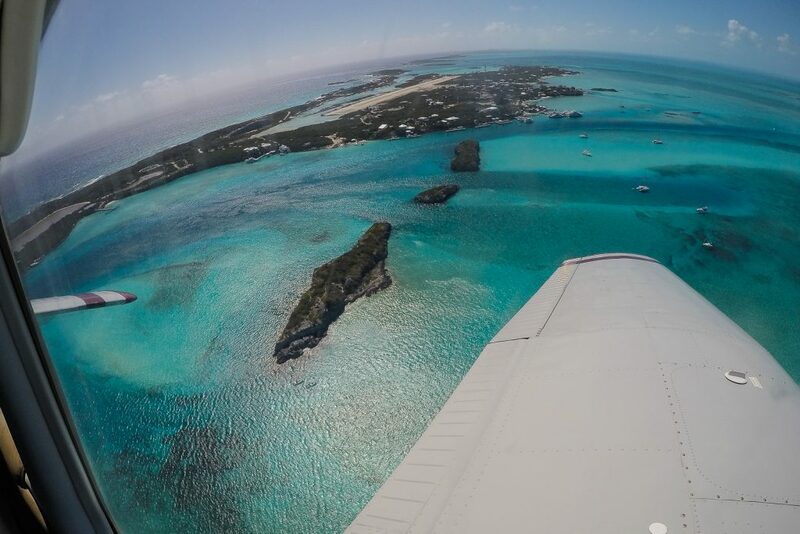 Using the Staniel Cay Yacht Club as your home base, you can go out and discover attractions like the Thunderball Grotto, the “Exuma Pigs” (Swimming Pigs) and the underwater plane wreck. Be sure to pack your snorkelling gear so that you can get a closer look at any of this ocean’s wonders. The Staniel Cay Yacht Club is undoubtedly the best place to stay on the island. With world class accommodation and only 14 rooms, this fantastic destination will allow you peace and privacy. If, however, you would like to meet new people and share in the beauty of the islands, the Staniel Cay Yacht Club is home to the best bar in the Bahamas. Sitting here with a cold drink of your choice in your hand you could come face to face with any number of people and celebrities with fascinating stories to share. There is one attraction, in particular, that is helping to make Staniel Cay increasingly popular. A visit to Big Major Cay and its Exuma Pigs has become the most sought-after trip in the world. 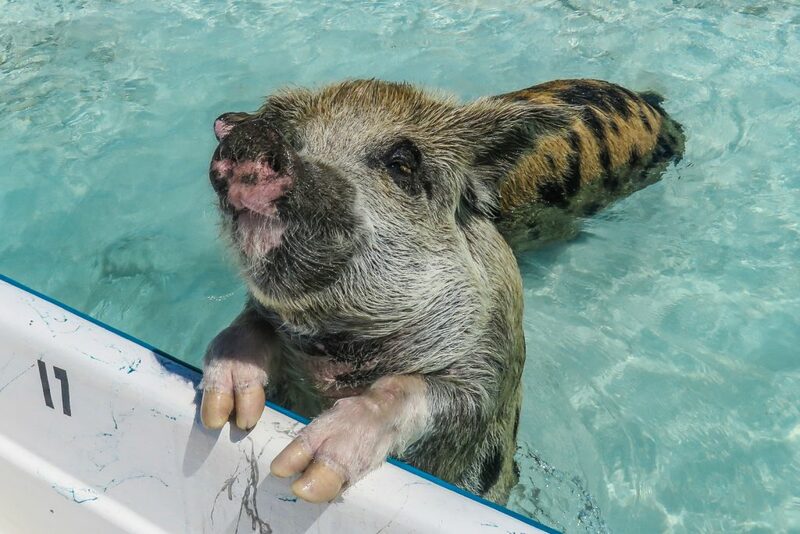 To see these Exuma Pigs swimming up to the side of your boat with their flat noses raised above the water is one of the world’s strangest and cutest things to behold. The Swimming Pigs are one of the highlights of a trip to Staniel Cay, adding an incredibly unique and exclusive aspect to your trip. 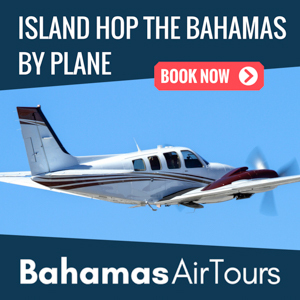 You can now visit the Exuma Pigs by plane from Nassau on the Nassau to Exuma Day Trip with Bahamas Air Tours. 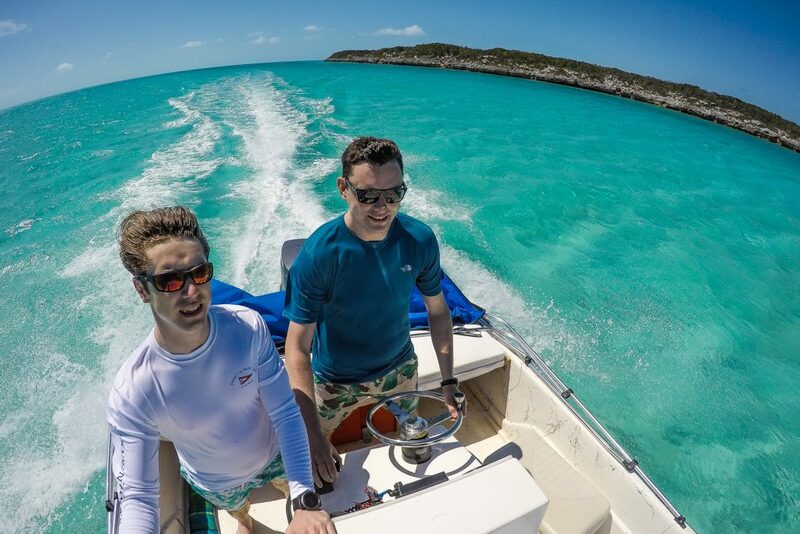 The best way to visit the swimming Exuma Pigs is by taking yourself there on a hired boat. The Swimming Pigs have gotten used to visitors and will swim out to meet you, excitedly expecting a snack. If you do bring food for them, they will gladly gulp it down and as you float in the incredibly clear turquoise water. To see these Exuma Pigs on your tour from Florida to Bahamas and experience this exclusive phenomenon is an absolute must when paying a visit to Staniel Cay. There are several different theories as to how the Exuma Pigs came to live on Big Major Cay. Some people believe that many years ago sailors brought pigs here, expecting to return to eat them, but never did. 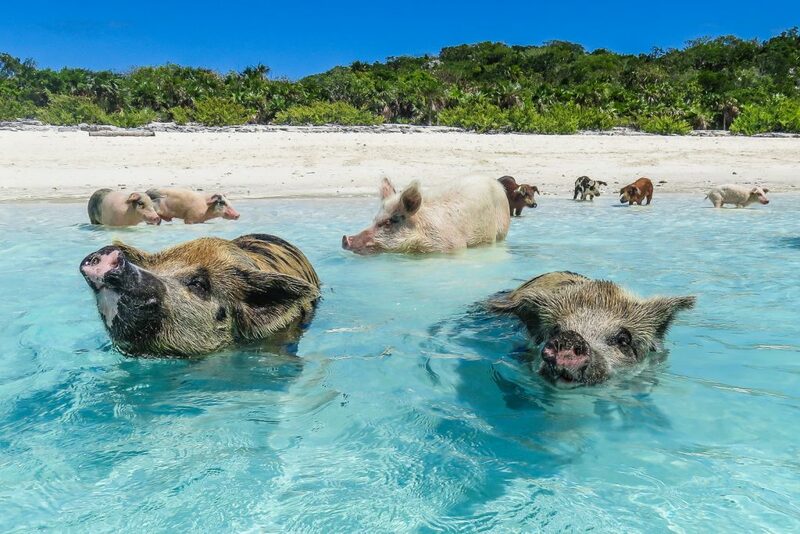 Others think the pigs may have been onboard a ship that sank, and they made their way to Big Major Cay, which is now unofficially known as Pig Beach. Whatever their origin, the Exuma Pigs have since become accustomed to their new surroundings and have become one of the top attractions in the Bahamas. The Exuma Pigs at Pig Beach on Big Major Cay is located at Pin #1 on our map of Staniel Cay. Bitter Guana Cay is a short boat ride from Staniel Cay. This island appears from a distance to be yet another tropical paradise with a white sandy beach. There is, however, far more to it than what first meets the eye. The Exuma Pigs are not the only interesting wildlife in this area. This island is home to the Bahamas Rock Iguana, a fascinating and rare creature that is under threat of becoming extinct. It is wildlife like this that make Staniel Cay and the Exumas so unique, and while the swimming pigs are great to see, the Bahamian Rock Iguana truly is a marvel. To visit this island you must be sure to wear your swimming shorts. You will have to anchor your boat, dive into the sparkling water and swim to shore if you want to get up close and personal with one of these fascinating creatures. The experience of anchoring your boat and swimming through this water certainly adds to the James Bond theme that these islands evoke. Fortunately for you, the chances of seeing one of these iguanas on a visit to Bitter Guana Cay is high because of their inquisitive nature. 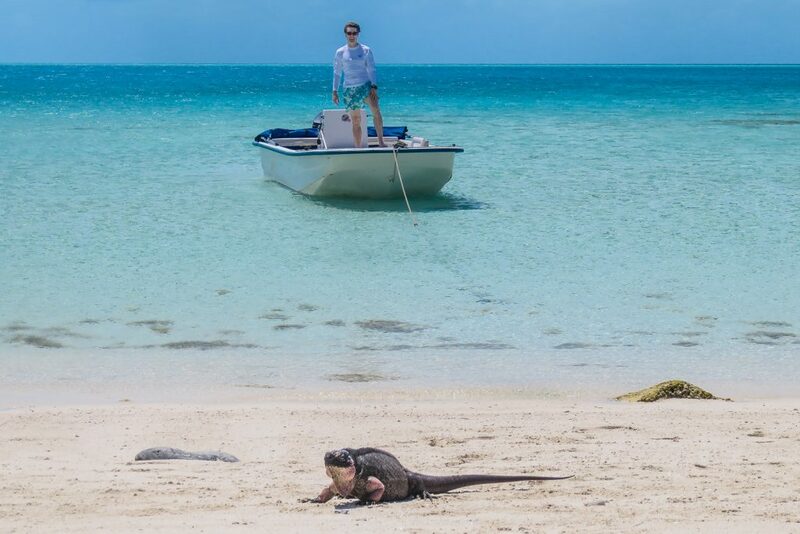 Upon arrival on the pristine shores of Bitter Guana Cay, you may spot one or two Bahamian Rock Iguanas. 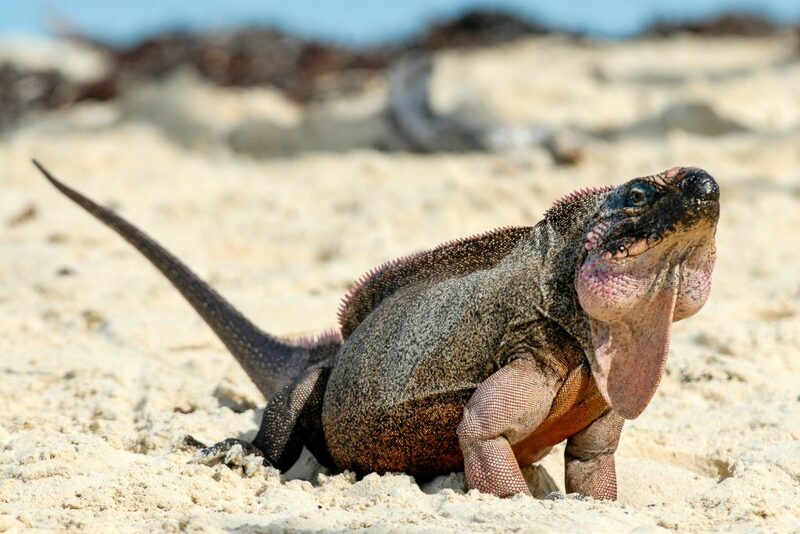 As you walk, however, and explore the beach a little more, you will notice that more and more iguanas will appear. Some will emerge from the shrubland or rocks and peer curiously at you. Soon enough you will have half a dozen iguanas strolling along the white sand. To experience something like this is really what makes visiting Staniel Cay and the Exuma Cays so exciting. Upon arrival at Bitter Guana Cay, early inhabitants sought the Rock Iguanas out as a source of food. Over the many years of this happening, they were hunted to almost extinction, which is why they are now protected by the Wild Animals (Protection) Act. Today it is illegal to harm or capture a Rock Iguana. This allows them to live in peace and serve as nothing more than an excellent tourist attraction that is quickly becoming as popular as the Exuma Pigs. The diet of these iguanas is also a little curious. When they are young, they eat mostly plants, but a fair number of insects as well. Once they are fully grown though, they become almost entirely herbivorous, eating only plants, fruits and flowers. Just like most cold-blooded animals, the Bahamian Rock Iguana needs to regulate their body temperatures. They do this by seeking refuge in holes in the limestone rocks on the shore. Not only do these rocks provide a good place to cool off, but their shade is often used as a haven for breeding and nesting their eggs. The Bahamas Rock Iguanas at Bitter Guana Cay are located at Pin #2 on our map of Staniel Cay. 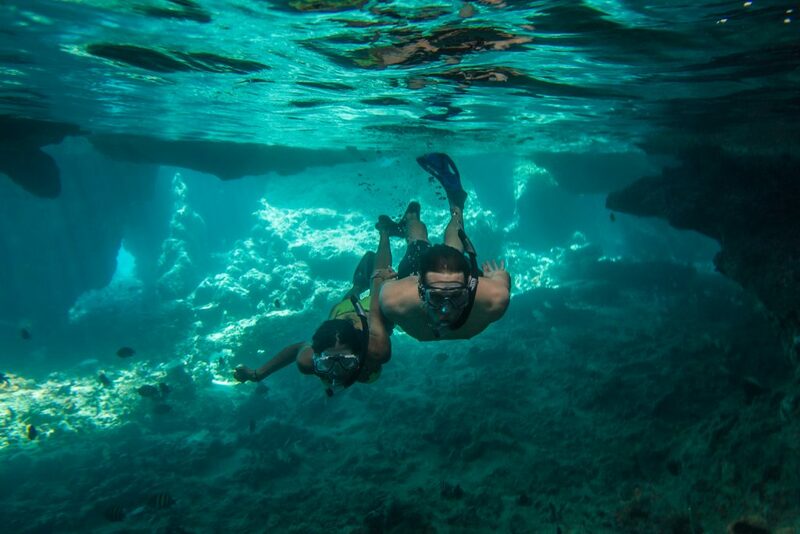 Of all the things to do during your stay at the Staniel Cay Yacht Club, visiting the famous Thunderball Grotto is one of the highlights. From the outside, this destination may not seem like much, but once you take a closer look, it’s no wonder Hollywood took a shine to it. The only way to reach the Thunderball Grotto is by snorkelling through the small entrance in the rock. What this means is that you will have to anchor your boat nearby and swim to the grotto. Staying on Staniel Cay island will mean you’re just minutes away from this exceptional attraction, making a vacation on Staniel Cay all the more desirable. Since there is no route on land to reach the Thunderball Grotto, your visit will depend heavily on the sea conditions. Not only will the ocean have to be relatively calm to ensure that you can enter and exit safely, but you will also need to visit during low tide. This is because the entrance is only accessible when the water level is below a certain point. Upon arrival inside this watery cave, you will realise why it is such an incredibly special place to visit. Sunlight shines through a hole in the grotto’s ceiling, illuminating the turquoise water of the cave. The water, in turn, reflects a shimmering light that flickers on the cave walls creating a mesmerising visual effect. Experiencing a visit to the Thunderball Grotto will give you excellent insight into why this has been used by Hollywood for the James Bond Films. You will truly feel immersed in the James Bond theme of the Exuma Cays. It’s destinations like this one that make a trip to the Out Islands of the Bahamas so worthwhile. The Thunderball Grotto is located at Pin #4 on our map of Staniel Cay. Want to swim with Sharks in the Bahamas? Take the short boat ride north from Staniel Cay to Compass Cay, a private island in the Exuma Cays. The sharks at Compass cay are actually pet sharks. They’re known as Nurse Sharks and are a type of Bahamian Cat fish which are bottom feeders. 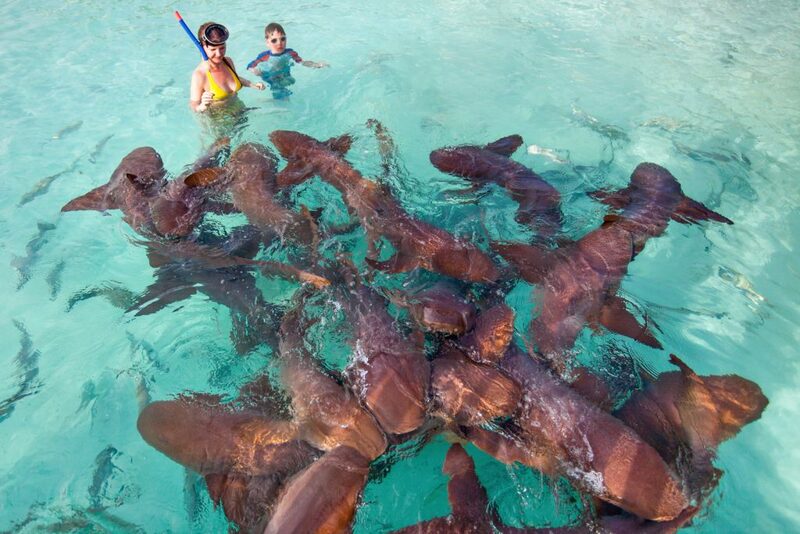 The owners of the marina at Compass Cay introduced the Nurse sharks here, which over time have become accustomed to their interaction with humans, so much so that they are considered as pets. It’s certainly a unique, and bucket list type activity to tick off on your Bahamas adventures! The Sharks at Compass Cay can be discovered at Pin #6 on our map of Staniel Cay. If the Thunderball Grotto awakens a thirst for adventure, then your very next stop should be the fascinating underwater plane wreck. 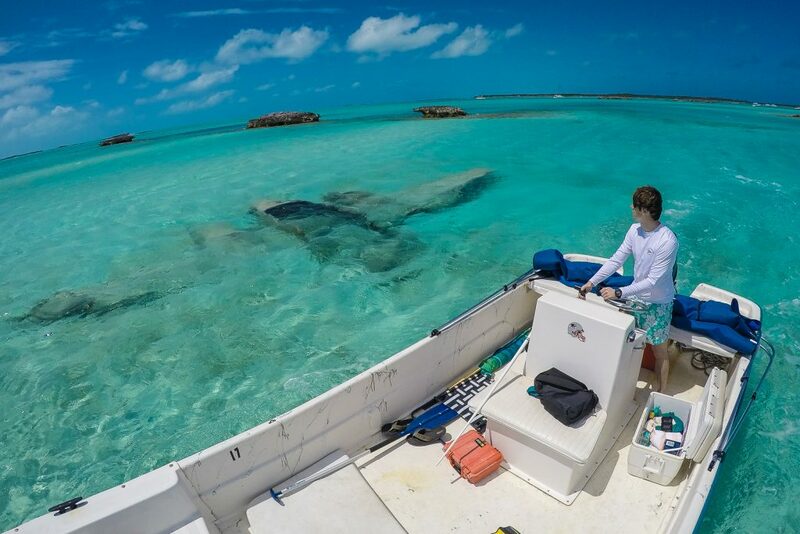 The only way to find this plane is to hire a boat and explore the waters around Staniel Cay. To cruise through the glistening turquoise water in search of a plane wreck will immerse you in the James Bond theme of these islands like almost nothing else can. 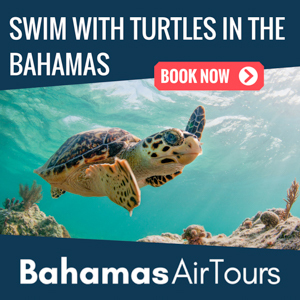 It’s for experiences like this and viewing the famed Exuma Pigs that make the trip from Florida to Bahamas and exploring the Exuma Cay islands worthwhile. Many people believe that this was a drug smugglers plane that was being used to transport drugs in the 1980’s. During this time drug smuggling was extremely prevalent in the Bahamas. It is believed that this plane was doing a test run with bags of flour to account for the weight of drugs. Smugglers would often do runs like this to practice making drops so that their operation ran smoothly. Unfortunately for them, this run was unsuccessful and the wreck now lies on the ocean floor for tourists to come and visit. The Underwater Plane Wreck can be discovered at Pin #3 on our map of Staniel Cay. Staniel Cay itself is an exceptional place to visit, it’s not all just about the nearby attractions. 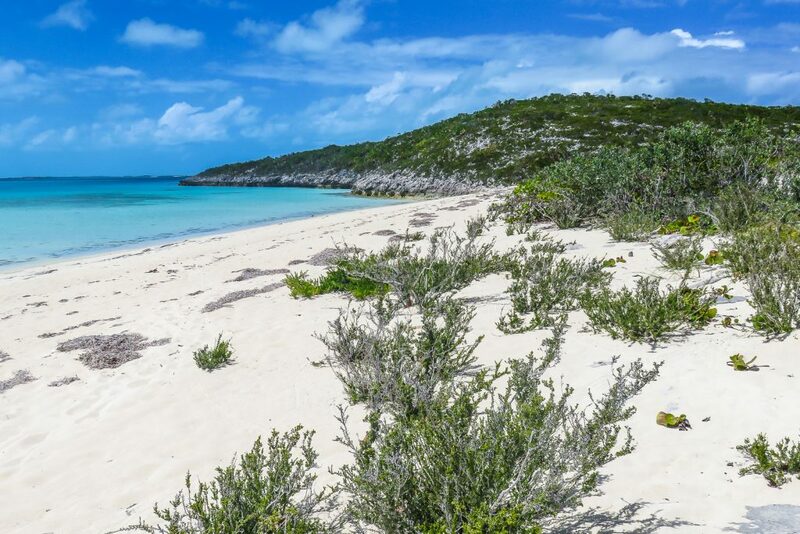 So whether you plan to visit for the Exuma Pigs, the Thunderball Grotto or the beautiful scenery, be sure to set a few days aside to explore Staniel Cay. 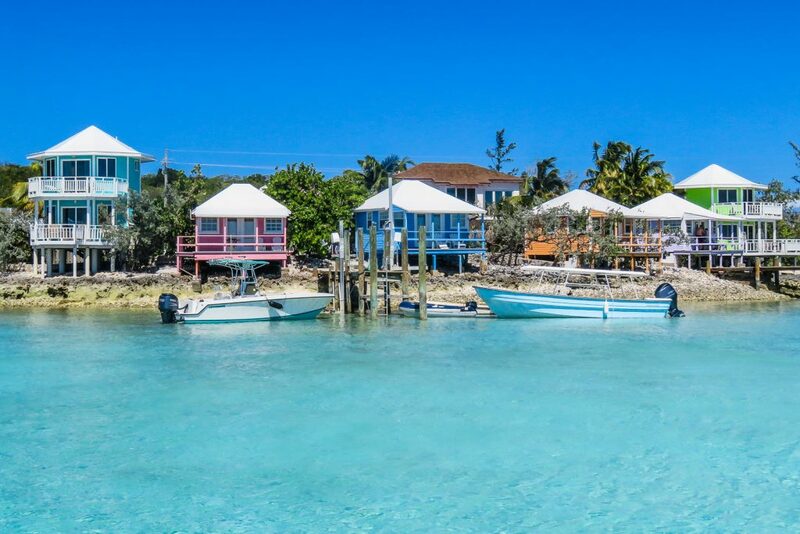 With a number of shops, restaurants, docks and beaches to choose from, Staniel Cay is certainly worth a visit. 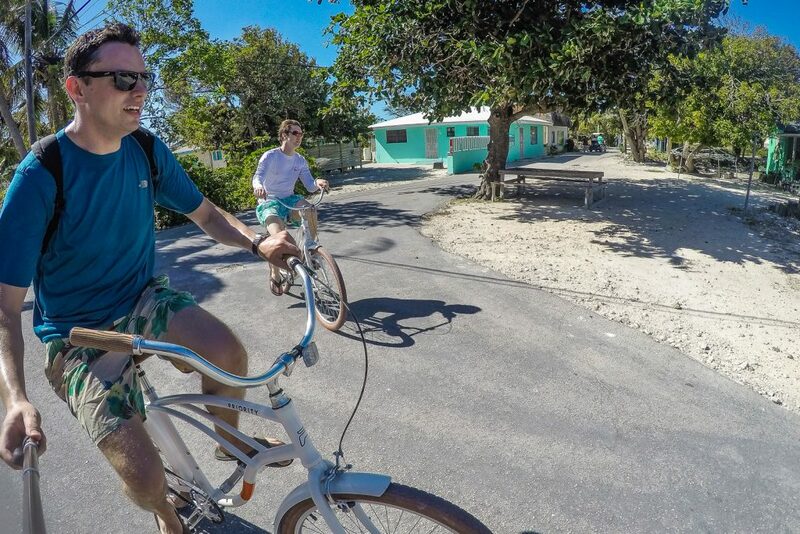 If you do want to explore this splendid island, one of the very best ways to do so is to rent a bicycle and tour the town on two wheels. The town emanates an undeniable charm that is only enhanced by the act of cycling casually through it. To fly from Florida to Bahamas and arrive here on Staniel Cay will almost make you feel silly for never having visited before. The amazing proximity of the Bahamas to the USA and the exceptional beauty of this destination is outstanding. Situated in one of the most beautiful places in the Bahamas you will find the luxury boutique hotel known as Staniel Cay Yacht Club. Not only does this hotel offer you the very best in Staniel Cay accommodations, but it also provides you with access to nearby attractions like the Exuma Pigs. What’s more is you can arrive at the Staniel Cay airport and go straight to the Staniel Cay boat rental offices at the Yacht Club to pick the vessel of your choice. When it comes to Staniel Cay accommodations, the Staniel Cay Yacht Club delivers in every way. You will be staying in one of 14 private bungalows that each have an entirely different colour scheme and personality. The soft colours of the Yellow Bungalow immerse you in the autumn glow of the sunset, while the Periwinkle Bungalow is more reminiscent of the ocean’s breathtaking blue hue. With your luxurious bungalow as a place to rest, you will have a chance to explore a number of the nearby attractions and destinations that make the Florida to Bahamas flight so worthwhile. Staniel Cay resort also provides the perfect base for exploring the island, visiting the Swimming Pigs and iguanas as well as taking the plunge and exploring Thunderball Grotto. Not only does it have it’s own Marina, where you will find luxury super yachts, but it is also in my opinion, home to the best bar in the Bahamas. The bar is incredibly lively and sociable, and an excellent place to meet fellow travellers and adventurers and share stories. 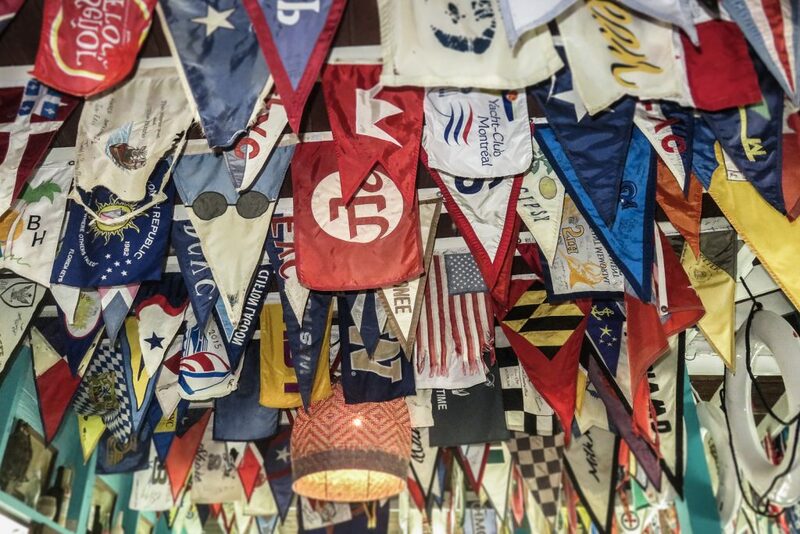 It is also visually impressive, adorned with sailing memorabilia. This is the perfect place to stop off in the morning to pick up a bite to eat before you disappear on your day of exploration. You can also ask at the bar for some tasty morsels to feed the swimming pigs. In-line with the entire James Bond theme of the Exuma Cay islands, the bar also offers an annual James Bond Casino Royale night. This draws in people from around the globe to take part in the exciting festivities. There is no place quite like Staniel Cay in the Bahamas. It offers a blend of absolutely everything that these phenomenal islands are known for. From the moment you arrive at the Staniel Cay Airport you are surrounded by mesmerising landscapes. The Staniel Cay accommodations are transcendent, and the facilities at your disposable allow you to visit the Swimming Pigs, Thunderball Grotto and even the fascinating plane wreck. The ambient atmosphere of the quiet islands and the thriving atmosphere of the Staniel Cay Yacht Club bar blend to create the perfect vacation. A trip from Florida to Bahamas is surprisingly short. If you do live in Florida, then you should make the most of this tropical paradise that’s practically on your doorstep. Upon arrival in the Bahamas, if you’ve planned to go to the island of Staniel Cay, you will be met with the choice of taking a private boat or plane to reach the island. Since Staniel Cay Airport is run exceptionally well, and the Staniel Cay Yacht Club offers boat rental, flying is your best option. 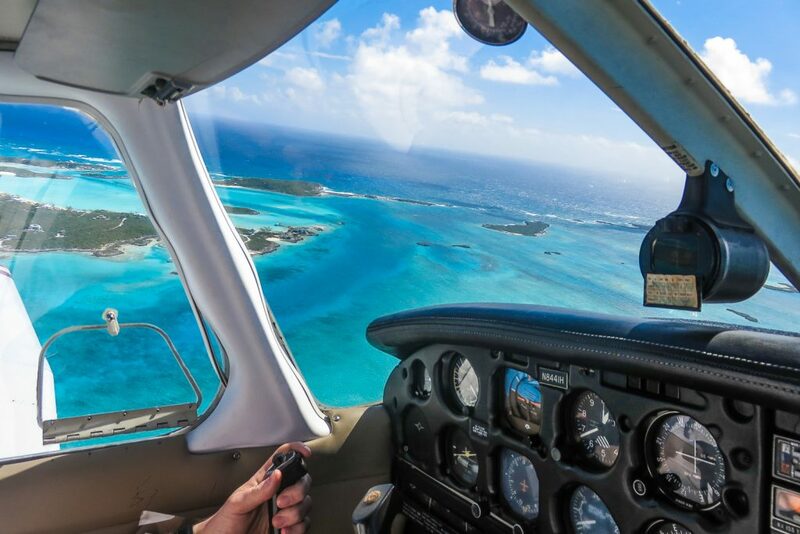 Not only is it more convenient to fly into the Staniel Cay Airport, you will also have the chance to view some jaw-dropping scenery along the way. 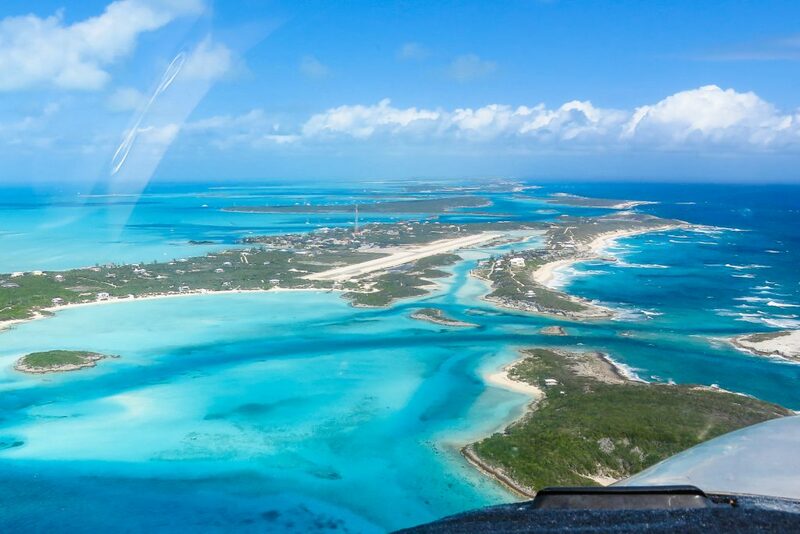 This aerial view will not only provide you with excellent vistas, but you will also get a better idea of how the entire string of Exuma Cay islands link up. The Staniel Cay Airport is also quite small, and can’t accommodate for large commercial jets. 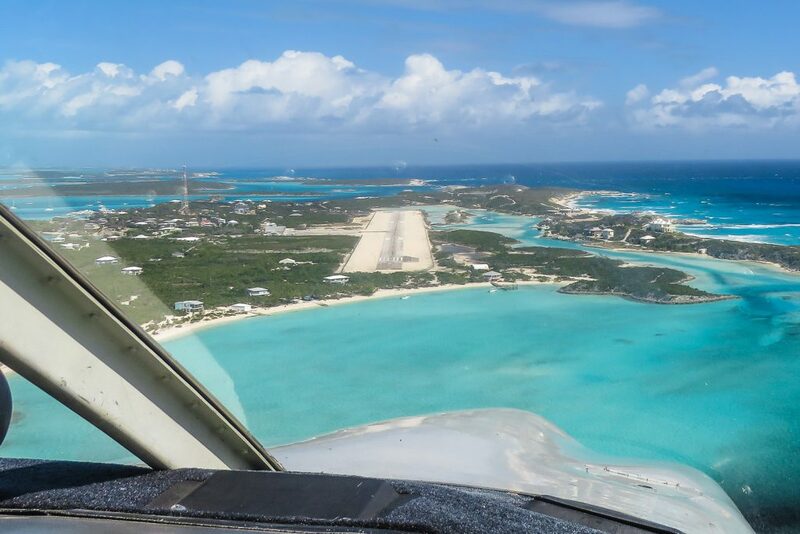 If you are a private pilot, it’s important to note that there is no customs at the Staniel Cay Airport. This means you will have to stop off at one of the Bahama’s international airports before flying here. What’s more is that there is no place to refuel here, which means you’ll have to do all your fuel stops at a larger airport. Seeing all that the Out Islands of the Bahamas has to offer has almost undoubtedly ignited the wanderlust within you. 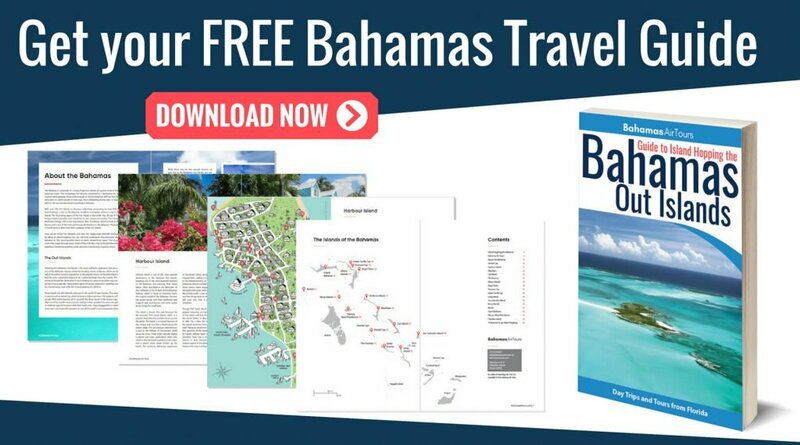 If you’d like to find out more read our Bahamas Travel Guide and Top things to do in the Bahamas articles to learn more. But while many people visit the Bahamas and stick to the main islands, book a flight from Florida to Bahamas and then make your way to Staniel Cay, you won’t regret it, I assure you. 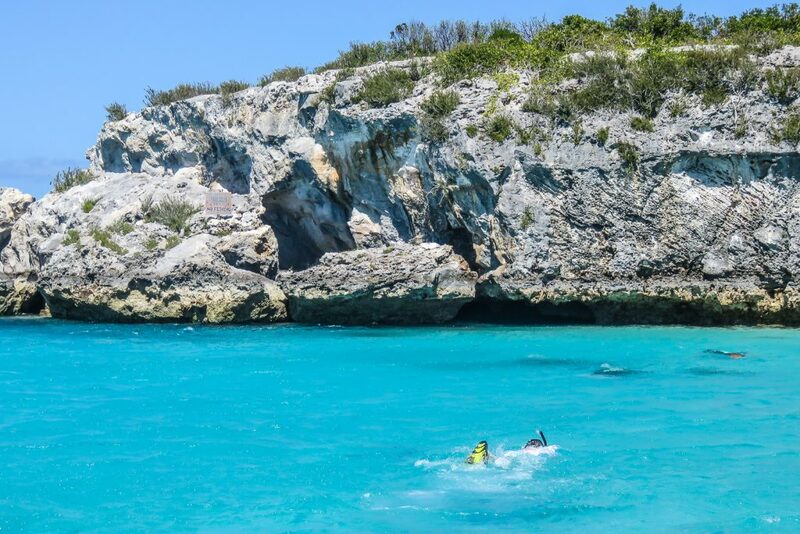 You will have a chance to see the Exuma pigs and Thunderball Grotto in person. With an incredible range of paradisaic vistas and exciting adventures to choose from, its no wonder that Staniel Cay and the Out Islands are the perfect vacation destination. What makes them so truly special is how untouched they are, there natural beauty emanates in every direction. 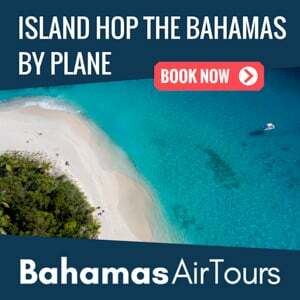 To visit these islands is to allow yourself a taste of the best that the world has to offer, and since the trip from Florida to Bahamas is such a short one, there really is no reason not to book a flight. 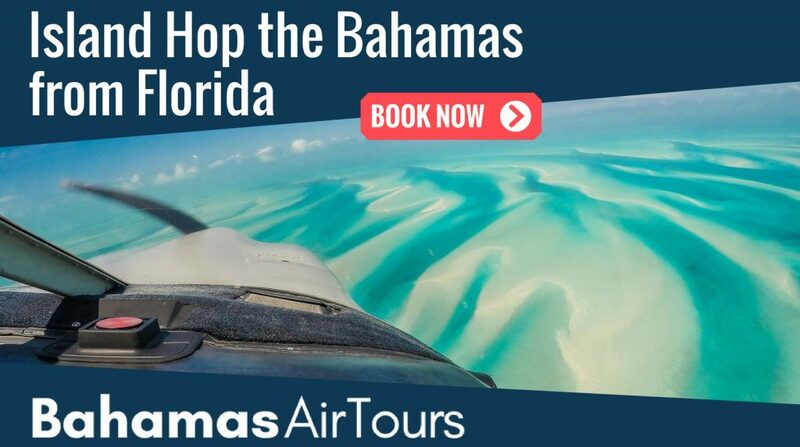 Take a Staniel Cay Day Tour with Bahamas Air Tours from Miami, Florida or Nassau.